Andy Wilson, had entered this years Manx Grand Prix races, and was one of the many riders left frustrated by the cancellation. However, he was particularly let down after putting so much effort into building a unique Norton Rotary F1 racer. Inspired by Norton stalwart Huw Huws from Wales who has been riding an F1 for many years at the Manx and his own long time fascination with Norton's from Commandos to the rotaries of the 80's and 90's, he began the lengthy task of building an F1 race bike twelve months ago. It started with a very expensive van load of bits in June last year, bought through an advert in Classic bike magazine. What was acquired was the bare bones of his race project. The Spondon frame and swing arm, plus about 75% of the engine components were the main contents of several large cardboard boxes that he started with. It soon became quite obvious that a good number of the missing pieces were going to be somewhat difficult to track down. Andy received enormous help and assistance from Graham Wilshaw at Startright Motorcycles in Leeds, Huw Huws who very kindly lent me lots of his "one off" parts to be copied during his winter rebuild, the staff of the Norton factory who (despite not inconsiderable problems) were consistently very helpful during his many factory visits and frantic phone calls, Peter Gibson who crafted the exhausts and several other impossible parts, Phil Allen for supplying carbs and remembering so many details about the factory racers, and even the great man Brian Crighton who gave Andy advice and came up with a Roton seat and tank. On top of this are all the friends and local firms who have done machining, welding, paintwork, fabricated billet yokes to accommodate the Suzuki TL1000 forks, made up linkages and cables, bushes and bearings etc, whom without Andy would never have achieved his goal. 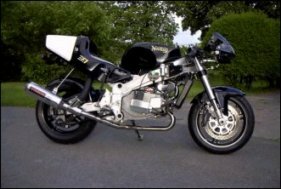 Unfortunately we are not going to get to see this fine piece of engineering at the Manx Grand prix this year, but I'm sure Andy will be back in 2002, with possibly a few more mods to the Norton.